So you've worked hard getting your lawn to look great and you want to show it off on the various organic lawn care forums that have helped you get to where you are. You walk outside, digital camera in hand and ear to ear grin as you snap pictures of your luscious green lawn. As you're downloading the photos from your camera so you can upload them for posting you start scratching your head. What happened to your nice green lawn? Where's the dark green color? Someone must have secretly swapped out your memory card and replaced the photos you took with a lawn that looks yellow and old. That's clearly not your lawn! Don't worry, your lawn is fine, you're pictures are not but with a few simple tips and one relatively inexpensive piece of equipment you can have your lawn as good as it does in pictures as it does in real life. Having a camera where you can control the exposure settings and the ability to add a filter is recommended but you can still get better results just by taking photos at the right time. The photo at the top of this post shows the same section of lawn taken on the same day. The right side looks more like what the lawn actually looks like the left side is what the camera thought the lawn looked like. There are some fundamental differences between how your eyes and brain works and how a digital or film camera works. One of the most important is dynamic range and exposure adjustment. If you're looking at a sun lit scene your eyes can see the brightly lit areas of lawn and even some critter lurking in the shadows of a shrub. That's because your eyes have a wider dynamic range and can quickly make adjustments. A camera has a much narrower dynamic range and needs to make a compromise in regards to exposure. If you take a picture of a sunny area with cast shadows you can get the sunlit area with the correct exposure and the shadows will be very dark, you can get the shadow areas to look right but the sunny areas will be washed out and too light but in most cases the automatic exposure in your cameras brain gives you a photo where the sunlit areas are too light and the shadow areas are too dark. Here's an example, what's the correct color and shade of the grass? Is it the shadow side? Is it the bright side? Is it those blades of grass that look white? Is it something in between? Is it none of the colors we see? To counteract this, you wan to take photos of your lawn with an even, diffuse light. If you've ever had a family portrait or seen a professional photo shoot, you'll notice that photographers use umbrellas, softboxes and other devices. These devices turn the relatively small flash light source into a larger light source. Large light sources produce a light that creates softer shadows and is more diffuse and provides more even coverage. Now you don't have to go out and buy expensive photo studio lighting equipment. The best light source you can use to take photos of your lawn and garden is the sun, the best softbox you can use are clouds. Take your photos on an a bright overcast day when there are no hot spots or strong shadows. You'll see a big difference right away. And DON'T USE FLASH! Hand in hand with dynamic range is proper exposure. A nice even light will give you a dynamic range that will work well with your camer and the proper exposure will make sure everything in that range will appear appropriately. If your exposure is off your grass might look too dark or too light. Automatic exposure systems have gotten better over the years but they still function on the basic principle of metering to 18% grey. Software in the camera may help get a better exposure but if you understand the metering it will help you get the best exposure you can. Point your camera at a white wall so it fills the entire frame with nothing else in it and the photo will look grey. Point it at a black wall and the photo will look grey. Point it at a scene that consists mostly of your green lawn and it will look gr... ok not gray but probably not the right shade of green. If you have a have a good light meter , you can use that to get the correct exposure, but you probably don't want that expense just to take pics of your lawn. Another more affordable option is to use a Kodak Gray Card . To use a photo gray card, you'll need to be able to adjust the metering of your camera manually. What you do is place the gray card on your lawn so the card is in the same nice even light that the lawn is, then you zoom in so only the card is in the frame and see what the camera says the aperture and shutter speed is for the correct exposure. Turn off automatic exposure and set your camera to those settings. Then step back frame your photo and take the shot. Your photo should look very close to what you think it should look like. Your camera may have some other method for locking in exposure so check with your owner's manual. If your camera has color balance controls you can use the grey card for that as well or just handle that in software. Another reason your lawn might look washed out in photos is because of glare and reflections. Think of looking at the surface of a lake or pond. It glistens and shimmers because the sunlight is reflecting off of it. Water isn't the only thing that reflects light, most objects do to some degree including grass, especially when it is wet. You won't see your face in the reflection but that extra amount of glare can throw off the color in the photo, making your lawn look much ligher than you see it. Just like you can get polarized sunglasses to reduce glare, there are polarized filters for camera lenses. They screw on to the front of your lens and have a front element that rotates. As you're looking through the viewfinder (or lcd screen if you don't have a viewfinder) you rotate the filter to align it properly to eliminate the glare. It should be fairly obvious when you have the circular polarizer in the correct position. Use this link to find a polarized filter for your camera or lens. Your camera lens should have a number on it that tells you the filter size or you can check your owner's manual to see if your camera accepts filters and what size. If your camera doesn't accept filters, you can just hold one in front of the lens and turn it. Just get one bigger than the actual size of your lens so you don't get your fingers or the rim of the filter in the shot. Keep in mind that the polarized filter will reduce the amount of light coming into the lens. That will affect your expsoure but as long as you check the exposure against the gray card while the filter is on the lens, you don't need to make any adjustments. Only if you are using a hand held meter do you need to make an adjustment. A polarized filter is great for a lot of purposes. Have you ever noticed that most of the time the sky in your pictures is white not blue? Or even if it's blue it's not a very nice dark blue like you remember? A porlizer can help you get the blue back in your sky as well. That's it! 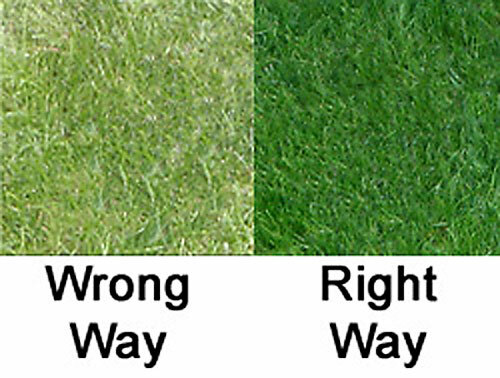 From now on you can take great photos that give a more accurate representation of your lawn and garden. By the way, these tips will help you take better photos outdoors in general and are not lawn specific so use them to take pics of your kids, your pets, your cars, your feet, whatever makes you happy. Take pictures outdoors without flash when there is a nice soft even light from a bright overcast day. No hotspots or shadows. Make sure you get the proper exposure, use a grey card. Use a circular poloarize to reduce glare on grass blades and foliage. That's all there is to it. You may need to make some adjustments in your editing program if the color balance or levels are off. Here's an example of a good photo of a lawn that still needs some work. Should have seen it a couple of years ago! 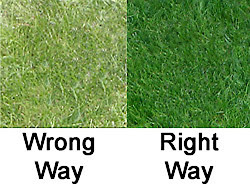 If you find these tips useful, feel free to post some links of your lawn and garden.